Japan in 2018 will look very similar to Japan in 2017 which was similar to Japan in 2016. Stop me if you’ve heard this one before. What we mean by this is that growth should improve, inflation is likely to remain weak and the central bank will maintain an incredible amount of monetary support via low rates and its various quantitative easing programs. The uptick in global growth is not going to miss Japan given its involvement in global supply chains while local business investment, consumer spending and preparations for the 2019 Rugby World Cup and 2020 Olympics should also help matters. Unfortunately, and this is not a solely Japanese phenomenon, this may not be enough to translate into meaningful and dependable inflation pressures. While unemployment is at a 23 year low, wage growth is flat. Some of this will be down to the productivity challenges that are besetting all developed economies at the moment, some of it will be down to the increase in labour-saving investment – AI and robotics – within Japanese industry and some of it will be as a result of the Japanese practice of rewarding higher wages to longer service employees. All three of these factors are structural and are unlikely to be shifted by the Bank of Japan keeping interest rates low but low they will stay. We also expect that Governor Kuroda will stay in place at the Bank of Japan once his term ends in March 2018. The yen is likely to come in for some selling pressure in 2018 we believe as the need for a safe haven currency will decline and the JPY will be used as a funding currency for carry trades into riskier assets. 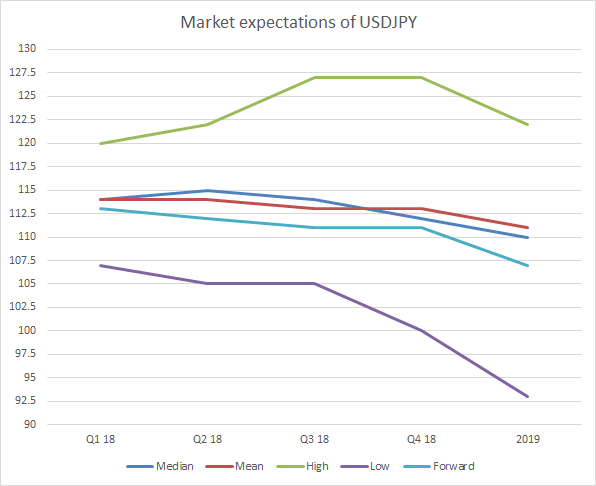 In the grand scheme of things however, USDJPY remains the currency pair that is used to express displeasure with the US political reform agenda and therefore yen weakness is always at risk of a Trumpian disappointment.